During their investigation, Wendelle Stevens, Tom Welsch, Lee & Brit Elders have made many trips to the FIGU center in Switzerland. According to Wendelle Stevens, the intelligence services of many countries – Switzerland, West Germany, East Germany, France, US, UK, Austria, Czechoslvakia, USSR, etc. – were also very interested in the Meier case and their investigation, and that their investigation team had many encounters with them. 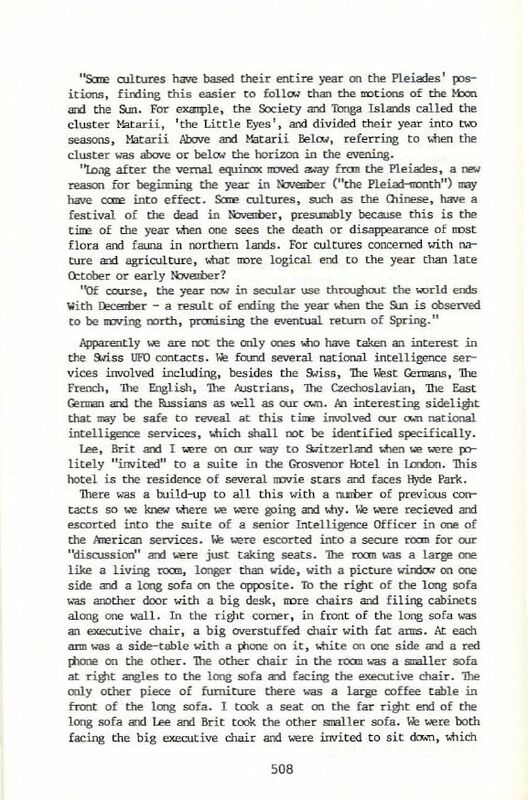 Wendelle also reported many strange things that were happening during their trips to Switzerland, some of which according to him seemed to have been arranged by the intelligence agencies, others so strange and unexplainable that they could probably only have been caused by the Pleiadians/Plejaren. 19:45 – The team, while carrying 300 beam ship pictures, travels through France in an railroad car guarded by French officers, without any other passengers in it. Wendelle again reiterates the same events at the 1999 (at 29:35 min) and 2006 (at 6:42 min) International UFO Congress. A comment related to the intelligence agencies made by one of the attendees of the 1999 lecture in a closed internet forum was published in FIGU Bulletin 22 in June 1999. Official Meier case representative Michael Horn published an article – Legendary UFO Expert, U.S. Air Force Lt. Colonel Wendelle Stevens Dies at 87 – September 21, 2010 – in 2010, where he again restated what Wendelle spoke about the activities of the alleged intelligence agencies. The activities of these intelligence agencies and other issues are also described in an article published in 2012 in UFO Digest titled ‘Billy Meier and the CIA’ (Part 1 & Part 2). For the entire email correspondence, see below. Since Lee has another version of these events than Wendelle, this calls into question what really happened, although according to Occam’s razor Lee’s version seems more plausible. But what about the other questions about strange events Lee didn’t have time to answer? Were there really any intelligence agencies involved at all, or is this narrative also the result of Wendelle’s ‘overactive mindset‘? Or did Wendelle only exaggerated some of the events? We hope to get more answers from Lee in the future, as soon as we do, we will add them to this page. 2. Your involvement with CIA which I presume you already might have been informed and I feel sorry for bringing this to you about the past events. Please forgive me. Wendelle in all of his IUFOC lectures, explains about the events where the secret services of various nations during your visit to Meiers place – used to stalk you, provide security, “abduct”, letters being sent by CIA station chief in London,..etc. Wendelle also said that CIA has requested your group to collect Meier material & hand over to them so that they can analyse them to which your group didn’t comply which made the CIA to “abduct” & were taken to a CIA station in London, where the photos you brought from Meier, were taken for observation into another room and after few minutes were returned to you (copies were likely returned). This Wendelle’s recollection of events show that nowhere did your group intentionally worked with CIA but were only forced to. So now Mr.Lee, I would like to request you to give an official response for the record, on what has been published by Meier regarding the relationship between you & CIA. The meeting that Wendelle referred to in London did indeed take place, but it was with a film producer and his director. Why Wendelle would state that we were abducted by the CIA and forced to deliver the photo’s to them is asinine. I can only say that in his final days, Wendelle did suffer from an over active mindset. Thank you Lee for clearing some controversial issues. Please see below for my responses followed by ***My doubts can be specific and lengthy at times, so I would like to heartily request you to take time & respond patiently. There has been a lot of misinformation, misinterpretation and disinformation on Meier case. And I would like to clear them all up and document/present the facts as they are; facts which lie under the colored versions of truth; consciously or subconsciously created by individuals beliefs or wishes. Now to answer your list of questions. ***Following is an article (2 parts) based on Wendelle’s version, which covers stories of how Intelligence agencies were involved in Meier case indirectly through your team. 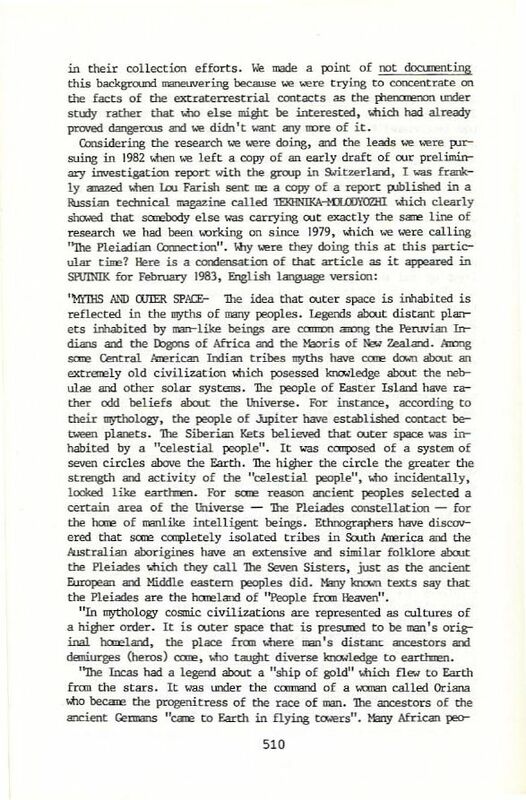 There is also an youtube video of the same information contained in above articles, which is an excerpt from International UFO Congress, 1994 spanning 23 minutes where Stevens goes into details of several instances of “unexplainable events” (involvement of Pleiadian & Intelligence agencies) which he suggests gives credibility to the Meier case. Lee, I would like to know if the above events has at least some truth in them in each case. Or are the whole events mentioned above, were as you said, created by the over-active mind of Stevens ? If you are interested you can answer to the above events individually below to the questions I have framed. Was your team ever being followed or your phones ever being tapped anytime during investigation ? Did you receive 2 letters addressed with the name Mark Nathan ? Did your team meet a person named Mark Nathan who is a CIA case officer for London district in Grosnover hotel, London ? 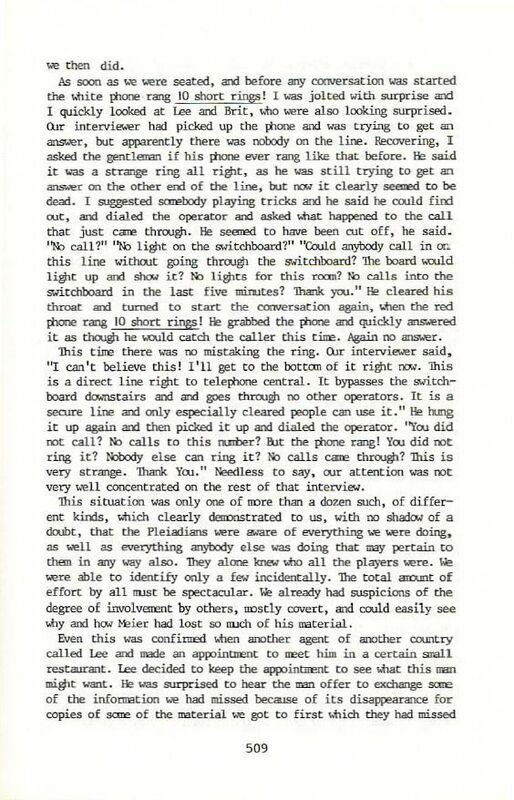 Did the red and white telephones gave 10 rings which is impossible and which suggest, was the sign of Pleiadians indirectly telling your team that you were being observed? Was your team frequently picked up by CIA & handed down the pictures (negatives, slides, films,..etc) during your visits to Switzerland ? Did your team visit Mark Nathans house(whose wife was a chinese intelligence agent before she got married) where you had dinner ? Did Mark Nathans blue book(which should be in his secret safe) suddenly out of no-where appeared in your teams room & later was taken back by him after being made aware of it? Did intelligence agencies of France helped your team to board train and stood guard at the compartments entrances? Relax. It is said that patience is a virtue. Be patient and in time perhaps you will find answers to your questions. Many of your questions will remain unanswered at this time. I am extremely busy writing my second book on my adventures in Ecuador. As to the other questions (which can only be answered by you or your team at that time), regarding the alleged (by Wendelle) paranormal events occurred during your trips, I can wait until you finish your 2nd book or when you would become free to respond. Hopefully it would be a couple of months from now or much sooner ! In my last email to you, dated June 12, I said that I would again approach you after you finish your 2nd book, for your response to my questions (originally sent to you on May 2) on the alleged paranormal events mentioned by late Wendelle Stevens in a video. Since your 2nd book is not yet out Mr. Lee, would it be possible for you to respond to my questions ? Or should I wait until it will be out in the near future? by the end of the year. The book should answer some of your questions concerning surveillance issues. I might add that the opposing forces had unlimited resources, contacts and were powerful, and complex. They occurred long before I was involved with the Billy Meier case. I feel that you will understand, once you have the opportunity to read and examine in full detail the events that led up to your questions. The paranormal events began in Ecuador (Read ‘Expeditions’) and have continued throughout my life to this day. I accept them as a positive influence that have offered guidance, protection and knowledge. The events referred to as paranormal in Wendelle’s video are mislabeled. I would prefer to acknowledge the telephone problems in London as electronic intrusions from a human source. The secret file found in my hotel room was the result of it having been mistakenly mixed in with my personal files when we left the residence. Pushing’ My Luck will be available sometime in 2015. The book is a continuation of my adventures in Ecuador during the 70’s and does not cover any investigations into the Meier case. The Meier investigation came years later – After my Expeditions into Ecuador.